This day began five days after Jack celebrated his 28th birthday. He had been in the Navy over 9 years. He was aboard the USS Oriskany in VA152 as a pilot of an A1-H Skyraider single engine fighter/bomber. "Three days later LT Feldhaus was shot down near Lang Quang.....Lang Quang is shown on the 1:250,000 Joint Operations Graphic (Air) Charts as Hill 1J06 near coordinates 19-30N, 105-30E"
These coordinates are the same as 19.5, 30.5 when searching for a place on Google maps. If you search, you'll see that the town is now named "Lang Bai" on the Google map. Wingman's Combat Damage: 10 inch hole in the starboard wing. The above map shows the path of the flight Jack and Fred Guenzel took 8 Oct 1966 when Jack was shot down and killed in action. 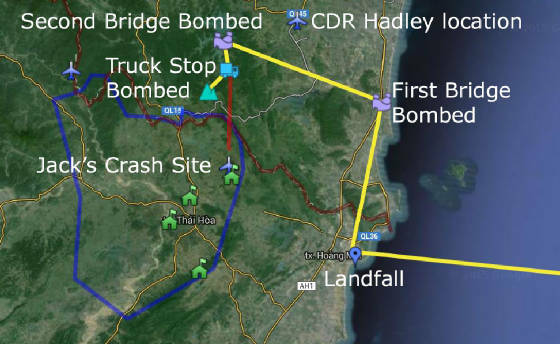 it shows the location where they made landfall, where they bombed the first bridge, where they bombed the second bridge, where they bombed a suspected truck stop, and where Jack crashed. "On 8 October 1966, LT Feldhaus in Locket 510 and myself in Locket 505 departed USS Oriskany (CVA 34) at approximately 0930 on an armed reconnaissance mission. We crossed the beach going inland at approximately 19-30N (19.5000N) and 105-13N (105.2167E) and proceeded to the north. We each dropped two one thousand pound bombs on a bridge on route 1A at approximately 19-30N (19.5000) and 105-40E (106.6667). We then headed in a general westerly direction preforming armed reconnaissance of the roads. LT Feldhaus dropped two five hundred pound bombs on a bridge at approximately 19-35N (19.5833) and 105-32E (105.5333)/ The weather in this area was 2500 feet broken and 7 miles in haze. At 19-32N (19.5333) and 105-32E (105.5333) LT Feldhaus and myself each dropped one 250 pound bomb apiece on a suspected truck park. Runs were made north to south, pulling off and coming around to the east. LT Feldhaus passed over the suspected site, and stated that there was nothing there and he proceeded down the road to the south." Based on the ship's lauch records and the above timely report by LCDR Gordon Smith, the VA-152 Skipper, it's clear that Jack and Fred weren't launched in response to a suspected beeper from a downed airman. They were on a routine Armed Reconnaissance mission. Below are copies of reports of what resulted from the events of that day. Click on the small square at the bottom right of the window below to read the reports in full screen mode.